Porcelain is actually a type of ceramic, but the materials it's made from (along with the extreme heats at which it's fired), make it far more durable and hard wearing than traditional ceramic. So what are the magic ingredients? Porcelain tiles are typically 50% Feldspar, 30-40% white clay, up to 15% Kaolin and up to 15% quartz, along with other fusible materials. The result? A strong and dense tile with supreme durability, which is resistant to abrasion, frost and chemical damage. They're also virtually impervious to water! Where should I use porcelain tiles? Porcelain tiles come in such an array of shapes, sizes, styles and colours that you can use them wherever you like throughout the home and garden. However, due to some of the qualities outlined above (high durability, frost proof, water resistant), they're a pretty good candidate for floor spaces with high footfall, wet rooms, bathrooms, and gardens! Hallways tend to receive a lot of foot traffic, since it's the space that family and friends shuffle through first, so that's an area that would certainly benefit from some sturdy porcelain tiles. When the summer months roll around, we all start thinking about how to make the best of those garden spaces. One simple solution is to create an outdoor patio area where we can lap up the sun, light up a BBQ, and enjoy the company of our guests. But which material to use? Decking is quite an outdated idea for an external seating area now; the wood rapidly deteriorates, and it's very slippery. Concrete slabs, another former favourite for patio spaces, are a very drab and lifeless option, which will rob your garden area of character. 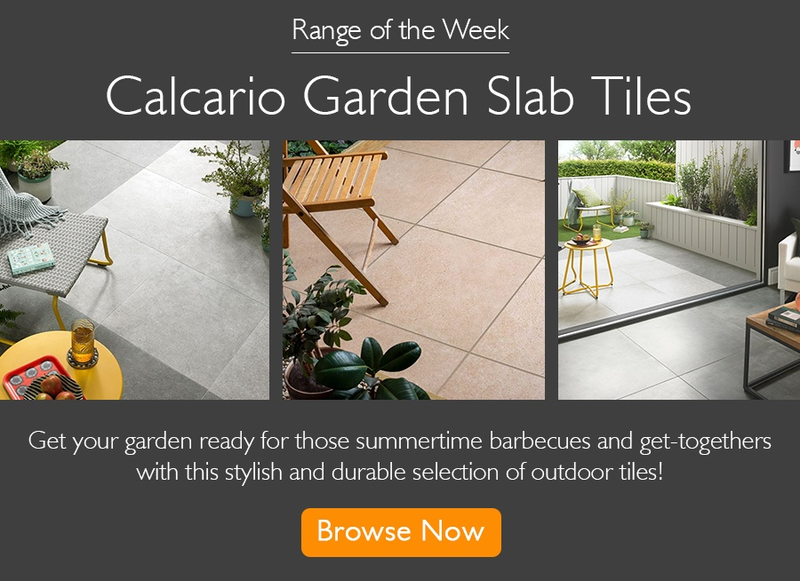 Porcelain tiles are proving to be a very popular option when it comes to creating a patio area in garden space. Not only are they practically resistant to water, but they're also very durable, and frost proof! For a gripping base in your garden, choose a porcelain design with an anti slip finish. There are plenty of stylish wood and stone effect designs to choose from. A big trend is to create an indoor to outdoor space. This is where the interior floor continues outdoors, at the same height, to create a seamless transition. When you think of ceramic and porcelain tiles, you probably think of plain white squares that go on in the bathroom and kitchen. But, in reality, the days when those were the only options are long gone! Advancements in the manufacturing and HD ink jet printing processes mean that porcelain tiles come in all sorts of shapes, sizes, styles and designs – in a multitude of different colours. From realistic wood effects and lifelike stone effects, through to captivating geometric patterns, hexagons and mosaics! All of the latest interior design trends are covered perfectly and, because of this, porcelain tiles are no longer limited to the bathroom and kitchen. Rather, they can be used as a long-lasting alternative to carpet, laminate, lino, hard wood flooring, paint and wallpaper throughout the entire home! They're even a stylish alternative to decking and patio slabs outside in the garden! Which porcelain tiles should I choose? It's all well and good having a multitude of different designs to choose from, but which will look best in your home? It all depends on what area you're tiling, and what look you're hoping to achieve. If you're tiling a space you'd like to relax in, such as a bathroom or bedroom, it's a great trick to create a soothing natural scheme. This is where stone effect tiles come in handy. Elegante Marble Effect Tiles are a popular choice for achieving this naturalistic spa-like look! If you're tiling a sociable space, such as a kitchen, dining room or living area, it's a good idea to inject lots of colour or pattern. You can use our Zeinah Tiles (which recently featured in the Ideal Home Show room sets) to create a statement floor, or Hexa Cube 3D Tiles (which recently appeared in HomeStyle Magazine) to create a feature wall. In a hallway, which is often the first area your guests will see, you want something that is not too overpowering, but isn't too plain, either. That's where wood effect tiles work well – particularly ones with a characterful reclaimed design, such as our Swoonworthy Wood Effect Tiles. If you're creating an outdoor space, we find that natural-styled designs work best. Again, try wood effect tiles, but ones with an anti slip finish to help make those patio spaces a little bit more gripping. Vintage Wood Plank Tiles work well for garden areas. If you've seen a few designs that you like the look of but you can't decide between them, or you want to see how the tiles look in place on your walls or floors, simply order a few sample tiles! Samples come full size and at a fraction of the cost of a full tile. Best of all, they come with Free Delivery. 1) Make sure the surface is clean and dry, and ensure any underfloor heating. 2) Apply the LTP MPG Sealer evenly to the surface using an LTP Buffing Cloth. 3) Leave for 20 minutes. Buff well to remove an excess from the surface. Do this whilst the LTP MPG Sealer is still wet. 4) Allow to dry for at least 3 hours – don't walk on the surface during this time. 5) Protect from water for 24 hours and don't wash the surfaces for a minimum of 3 days. With polished porcelain tiles, avoid using steam cleaners, bleach or other strong acidic / alkaline cleaning solutions, as they may damage the seal. When it comes to cleaning and caring for all types of porcelain tiles – whether polished or not - use LTP Waxwash. It will keep your tiles looking as fresh and as new as the day you first installed them. If using a manual tile cutter, sit the tile in the cutting bed and line your marked line up with the scribing wheel. Take the handle, and push the scribing wheel across the surface of the tile. Once you've done this, use the small snapping arm to place over the top of the tile, and apply gentle pressure to the arm. This will snap the tile cleanly. If using an electric / wet cutter, make sure to keep it switched off until you're ready to use it. Place the tile into the cutter, taking it the width of the blade. Turn it on, and gently push the tile into the blade. It will give you a nice, clean cut. Due to potential mess, we usually recommend using wet cutters outside. Wherever you're tiling a wall or floor with your porcelain tiles, the process remains roughly the same, and can be broken into three main stages: plan the layout, apply the tiles with adhesive, and finally grout the joints before cleaning up. We've created a handy How to Tile section on our blog, with step by step video tutorial guides for tiling walls, floors, bathrooms and kitchens. Go and take a look! There you have it – a complete guide to porcelain tiles. In summary, they’re a sturdy, water resistant and frost-proof offering of tiles, which are especially good for use on floor spaces, in bathrooms, and outside in the garden. They come in lots of styles, and can be used to introduce different trends and looks throughout the home. And the best way to see which ones work best in your home is to order samples.